The Valley of Kainchi, a hidden gem in the Kumaon area of the Himalayas, the ‘land of the Gods,’ holds the essence of sages and siddhas who have graced this land and its people with their presence for centuries. It is a place of extraordinary beauty, serenity and spiritual energy that can effortlessly guide you to your pure and limitless inner core. Immersing yourself in this inspiring oasis will help you deepen your inner process of enlightenment and become more firmly established in your true love and wisdom. These Immersions are an offering from our hearts to yours. Guided by Ramgiri and Durga we will gather in the sacred and beautiful landscape of the Himalayan mountains and let the peaceful and devotional atmosphere of this profoundly sacred place take us deep into the core of our being. We will bathe in the transforming grace of Maharaji, the legendary Mahasiddha (fully accomplished being), whose essence and greatness are felt in every corner, even after he left his body many years ago. We will gather in Satsang, meditate, chant, talk and pray together. We will embark on pilgrimage to the most important sacred sites of this region. We will spend time and be part of the rituals in the Ashram of Maharajji Neem Karoli Baba, opening ourselves to grace. This is a unique opportunity to surrender into a deeper love and peace inside you. To step away from your usual busy life and to lay your mind at rest for a while. The guru has countless forms and we can enjoy them all: He is the Beloved in form, as alive today as ever; He is the inner controller, the antaryami, the knower of all hearts; He is the world and teaches, loves and guides us through everything; and He is the Oneness we find in the moment of absolute Self-love, which we are called to cultivate and make permanent. Join us for 2 weeks of descending into the limitless well of the heart to heal, nurture, and liberate you. Through HeartSourcing, chanting, story telling, ritual, meditation, yoga, satsang and feasting we will evoke the sacred presence of the sadguru in us and as us. Become deeply enriched and prepared to share this grace with the world around you. The Goddess is the embodiment of absolute love. It is the love in all things and for all things, and you are qualified for that sublime experience. 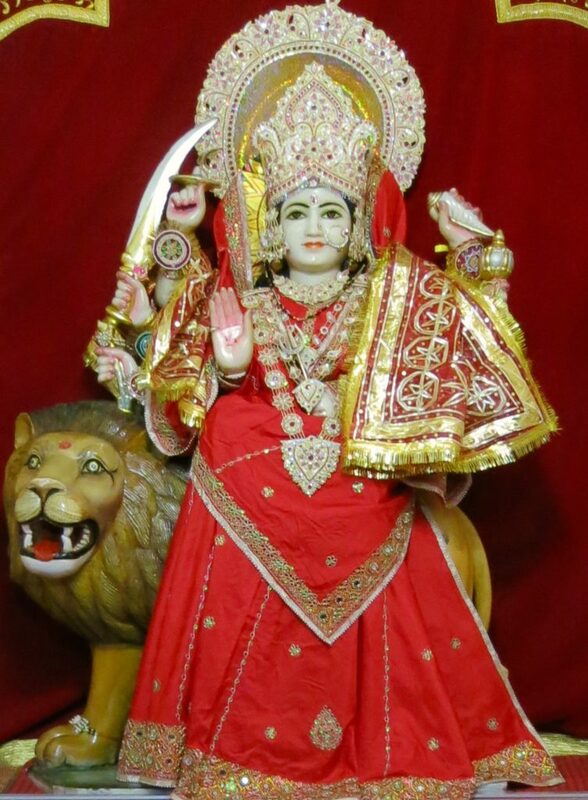 As we participate in the ashram’s yearly worship of Durga (Durga Puja) in her 3 aspects of Kali, Laxmi, and Saraswati, we will immerse ourselves in the mystical meaning of the Goddess’ epic fight against the demons, which symbolizes and reveals intimate aspects of our own journey. 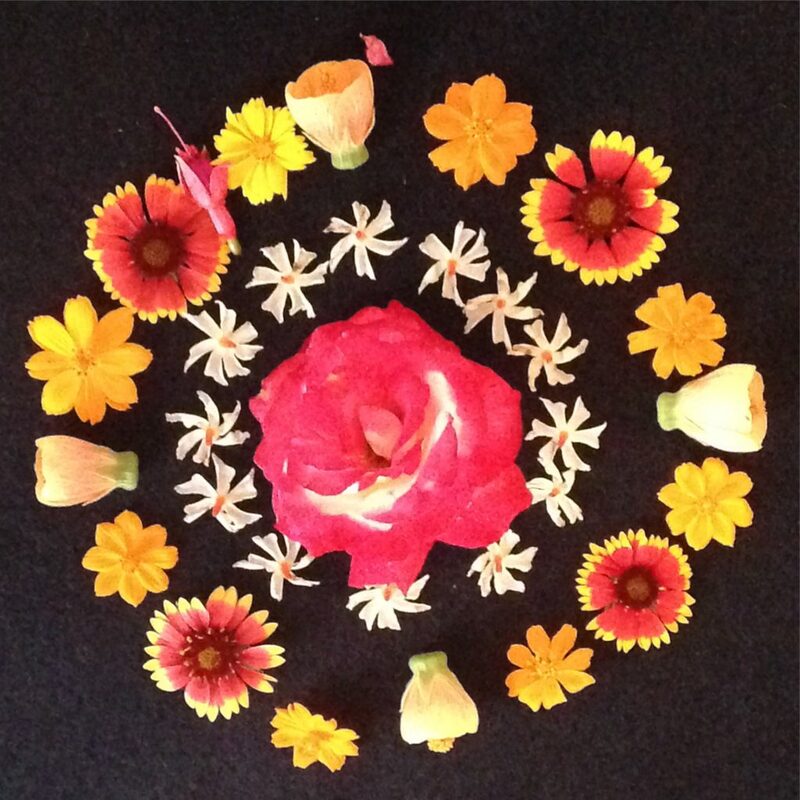 Through HeartSourcing, chanting, story telling, ritual, meditation, yoga, satsang and feasting we will evoke the sacred presence of the Divine Feminine in us and as us. We invite all women and men who want to reach a deeper accord with their feminine aspect to this retreat. It will empower you to carry Maharaji’s complete love for the Divine Mother as your own into your world. Through HeartSourcing, chanting, story telling, ritual, meditation, yoga, satsang and feasting we will evoke the sacred presence of the Divine Beloved in us and as us. This celebration of the Beloved culminates in the recognition that the absolute intimacy of oneness is your true heart-essence, your already present state of enlightened being. Meet at the suggested Hotel in Delhi at 5pm and stay overnight. Next morning travel by train to Kathgodam and then on by car to Kainchi Dham. 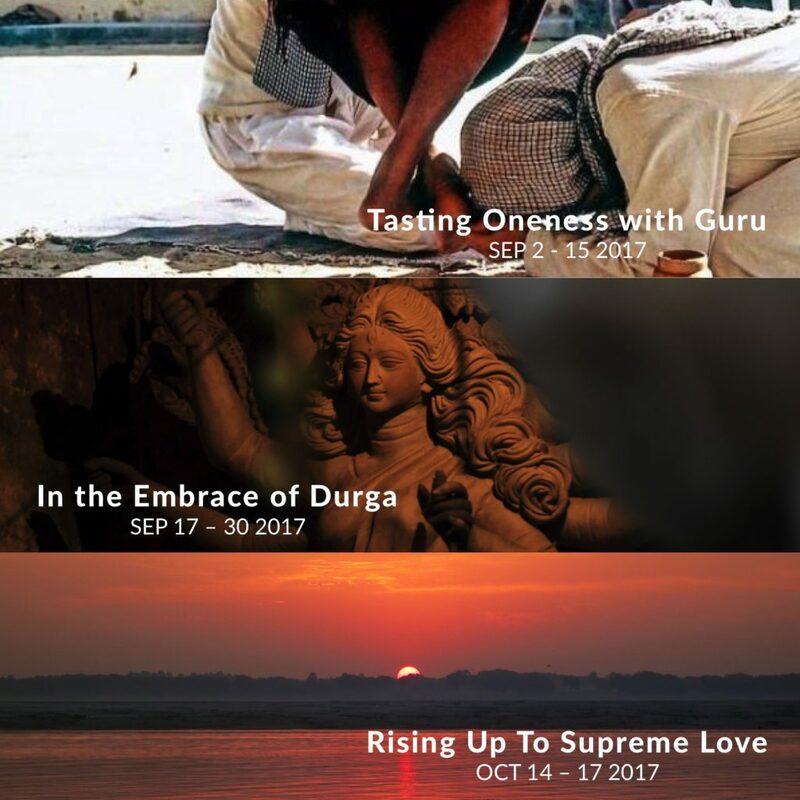 13 nights HeartSourcing Immersion with Ramgiri and Durga, including hatha yoga, workshops, fire ceremony, chanting and kirtan, HeartSourcing® Meditation and satsang. Daily morning asana, pranayama, yoga nidra sessions with Durga. 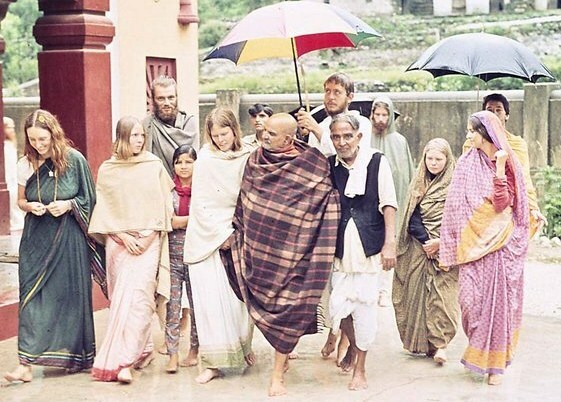 Day trips (walking distance) to Neem Karoli Baba’s Kainchi Ashram. Guided trips to local sacred sites such as Kakrighat and Hamunaghar. Hiking trips in the mountains of Kainchi Valley. Return to suggested Hotel in Delhi (Immersions 1 & 3) and Katgodham Train Station (Immersion 2). You can participate in these offerings as much or as little as you feel drawn to do. We trust your wisdom mind’s ability to guide you in that. But the most important element is the environment, the subtle yet powerful transformation one can experience by being and relaxing in the sacredness of Kainchi, which is incomparable. We know it will change you and your world. • An add-on pilgrimage to the spiritual capital of India – Varanasi (Benares). • Accommodation (14-days/13-nights or 28-days/27-nights ) at Sudha Amar Retreat, Kainchi Valley. Rooms are double occupancy with en suite bathroom. A few single occupancy rooms are available. • Ground Transportation Delhi – Kainchi – Delhi. • Yoga mat may be provided – feel free to bring your own if you want to. Within 24 hours of paying your deposit, you will receive an email with a comprehensive Welcome Packet containing detailed information about travel itinerary, accommodations, health and safety, weather, travel documents, and a packing list. We will support you through the process of getting an Indian Tourist Visa and arranging your travel as needed, and with any questions or concerns you may have along the way. Please send us an email with any specific questions or for details. NOTE: A waiting list will be issued in the event we have an overflow on our pre-registration. For cancellation policies, please refer to the payment details below. NOTE: Please select accordingly based on the Immersion type you have selected (1 immersion/2weeks, 2 immersions/4 weeks). If you reside outside the US, please select “Non-US Balance.” Thank you. The total cost for one (1) Immersion (14days/13nights) is $2200 for a shared room and $2500 for a single. The total cost for two (2) Immersions (29days/28nights) is $4,000 for a shared room and $4,600 for a single. If you are registering for 1 Immersion: The initial $400 deposit is fully refundable until March 1, and then $200 is refundable until June 1. All deposits are nonrefundable after July 1, 2017. Transaction fees if paid via PayPal are not refundable. Full payment must be received by July 1 to guarantee your spot. If you are registering for 2 Immersions: The initial $800 deposit is fully refundable until March 1, and then $400 is refundable until June 1. All deposits are nonrefundable after July 1, 2017. Transaction fees if paid via PayPal are not refundable. Single rooms are limited and available on a first come first serve basis. We do require that you purchase traveler’s insurance. There are numerous options to choose from, including World Nomads and Travel Guard. 4 to 8 weeks before the start of your retreat: 50% refund, minus the deposit. You may cancel your retreat at any time providing that the cancellation is made by the person submitting the booking form and is communicated to us in writing to this email. In the event we, Ramgiri and Durga, need to cancel any or both of our planned retreats, you’ll be refunded 100%, minus the deposit.